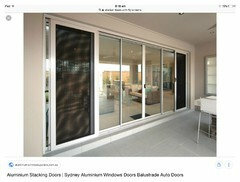 I am considering putting in 2 sets of 16 foot long stacking sliding doors but am looking for a screen option that can be opened and closed easily to keep out flies but to let kids in and out. Fly screens can be included. 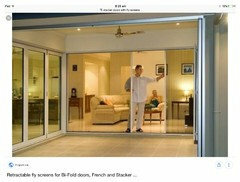 The track is wider to accommodate two sets of sliding doors, one your glass, the other your fly screen. Another option could be a retractable fly screen. This allows when the doors are completely open (no bugs around) the fly screen can be retracted completely to side of window frame.